De La Hoya and Mosley posing for the fight poster for their upcoming Championship return bout. Before these two fighters had ever stepped into the ring as professionals, Oscar De La Hoya and Shane Mosley had known each other since they were kids. Being that they were both Southern California products eventually they met and would be at the same competitions in the amateurs. Both had very decorated dossiers; De La Hoya winning the Gold Medal at the Olympics in Barcelona in 1992 and Mosley with an amateur record of 96-3, twice winning the United States Amateur Lightweight Championship in 1989 and 1990. Mosley also was the United States Junior Welterweight Amateur Champion in 1992, the same year Oscar had won his gold medal. De La Hoya and Mosley squaring off, pre fight poster in 2000. 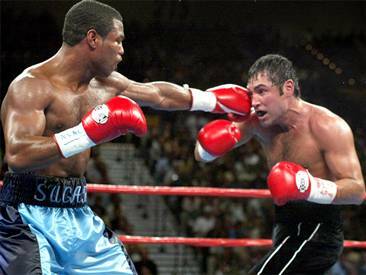 On June 17th, 2000 at Staples Center in Los Angeles,California, Oscar De La Hoya had lost his WBC Welterweight Championship to fellow Californian”Sugar” Shane Mosley, in a fight of the year candidate. Mosley was awarded with a well deserved Split Decision victory, although it had seemed clear he had beaten De La Hoya unanimously in a great fight. 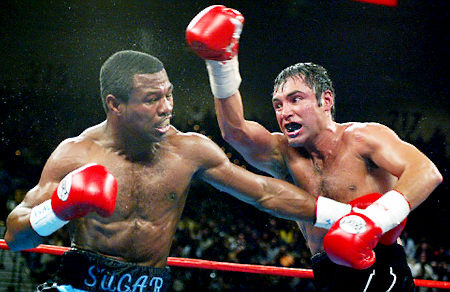 "Sugar" Shane out hustling Oscar De La Hoya down the stretch of their first epic encounter. Mosley had come up twelve pounds in weight after eight successful title defenses as the IBF Lightweight Champion and was undefeated. 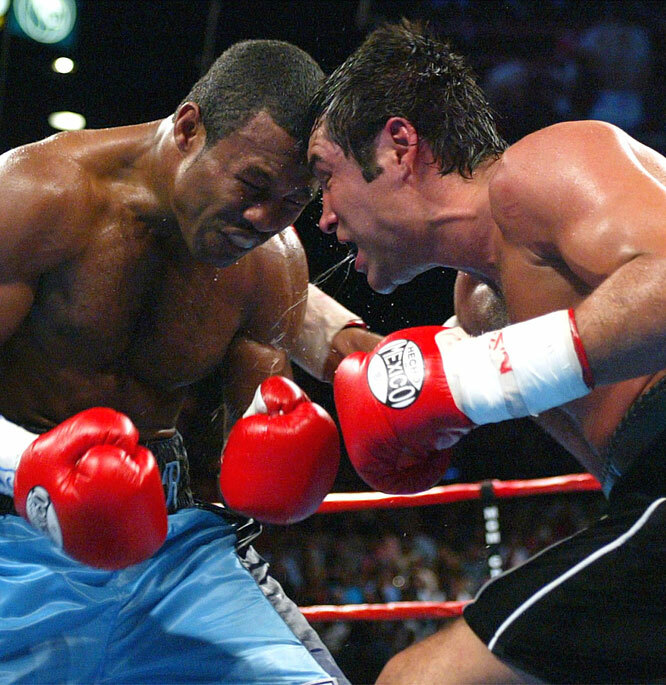 De La Hoya, the year before, had suffered his first defeat at the hands of the great Felix “Tito” Trinidad in their Welterweight unification. That fight however, between De La Hoya and Trinidad, had been scored incorrectly in the eyes of many fans and boxing experts alike. Shane went into the fight being a slight underdog due to him coming up in weight. Three years later the rematch of De La Hoya/Mosley had been signed for September 13th, 2003 at the MGM Grand Garden Arena in Las Vegas. Shane Mosley was no longer undefeated having lost his Welterweight Championship in early 2002 via unanimous decision to Vernon Forrest. Not only did Shane lose, but he was favored to beat Forrest and was beaten up in a one sided fight and had been knocked down for the first time in his career. Six months later, Mosley had a rematch with Forrest to try and reclaim his Welterweight Championship. However he was unsuccessful, though this time he managed to put on a much more competitive showing against Forrest. Oscar De La Hoya, on the other side of the table, had a lot of momentum coming into the rematch. One year after losing his Welterweight Championship to Mosley, De La Hoya moved up seven pounds to the 154 pound, Jr. Middleweight weight division, and rebounded with a one sided victory over Spain’s WBC Jr. Middleweight Champion, Javier Castillejo. Fifteen months later he fought against WBA Jr. Middleweight Champion and fellow Californian, “El Feroz” Fernando Vargas. De La Hoya scored a scintillating eleventh round Knockout in a terrific fight that was billed “Bad Blood” because of Vargas and De La Hoya’s heated rivalry. Those two bouts with Castillejo and Vargas made De La Hoya the unified champion at 154 pounds. Many in the boxing community expected another highly competitive fight for the anticipated grudge match. Some felt that Shane would beat Oscar as close and as hard as he did in their first bout in 2000. While others believed that Shane coming up in weight another seven pounds would slow down his incredible speed and give De La Hoya an ever bigger size advantage. As well as being an improved fighter than he was three years before. The stage was set to see if Shane Mosley could rectify his recent losses by moving up in weight and once again dethroning De La Hoya of his Championship. On the other hand Oscar De La Hoya could avenge his loss to Shane Mosley, and if he could win this fight, wash away the notion from his critics that he could not win “the big one” against a fighter in his prime. Round one begins with De La Hoya moving swiftly on his toes and allowing Mosley to come forward. Oscar opens up with his jab, throwing it repeatedly and landing well with some. Oscar doubles up and lands his jab, and once more right after. The action thus far has been fought all in the center of the ring. De La Hoya opens up with a left hook-right cross, both land well. Shane now digs to the belly of De La Hoya with a jab. Oscar responds with two landed jabs, he doubles it up again and lands both, and once more he doubles his left jab up and nails Mosley. Mosley now digs in hard with a sweeping right to Oscar’s body, De La Hoya throws a three punch, one-two left uppercut combination in response. De La Hoya sticks the double jab out and lands, Shane counters with a hard left hook that for a split second buckles De La Hoya. Oscar works his double jab again, sticking it into Mosley’s face. Shane, marching forward digs in with a very good sweeping right to the gut of De La Hoya. Shane still coming forward gets hit with the double jab again, but responds with a good left hook upstairs. Mosley lands a flush jab upstairs of his own, and Oscar responds with a quick right cross to the body to close the round. De La Hoya for the most part dominated the round with his left jab, Mosley to his credit may have landed the best punch of the round with his flush left hook that buckled De La Hoya for a second, midway through the first. The action again begins in the center of the ring. De La Hoya opens up the stanza with a left hook and follows it up with a stiff double jab. The two exchange on the inside now, and De La Hoya outworks Mosley. Mosley digs in hard with a right to the body, and Oscar tries to respond with a flurry of punches, some missing, a few landing. De La Hoya pumps out his jab twice and lands clean. Mosley comes back with a left hook upstairs and digs in combination to Oscar’s body. Oscar now is standing in front of Shane, and lands another double jab, Shane lands his own flush jab while Oscar was doubling up his. Shane digs into the body with another hard sweeping right hand. De La Hoya responds with a hard left hook downstairs. Oscar again doubles up his jab effectively, and does it once more in the center of the ring. Again, De La Hoya pops out left jab twice and gets a response from Shane with hardly thrown, effectively landed body blows from the left and right hand. Shane and Oscar exchange, De La Hoya with a left hook and Mosley with a right cross, both to the head, both landing. A clean jab by De La Hoya to close the round. A round dictated by Oscar De La Hoya and his effective left jab. Mosley did some good body work. Oscar getting the better of the action early on. Round three begins the same as the first two, with both men fighting in the center of the ring. Oscar starts off with a jab to the gut of Mosley, followed up by a left hook upstairs. Shane begins pawing with his jab and is countered over the top of the jab with a right cross by De La Hoya. A hard left hook lands to the body by Mosley. Oscar returns by popping his left jab twice, Shane lands a good left hook while Oscar was landing his jab. Shane lands a hard, flush, right hand upstairs and Oscar responds with a left hook. Shane is coming forward and gets popped by another De La Hoya doubled up jab. Oscar begins moving well side to side, and Shane continues forward. De La Hoya pops the jab to Mosley’s gut and works it upstairs right after. Oscar lands another jab but is given a hard right hand up top by Mosley in response. Oscar doubles up his jab effectively, and the two trade stiff jabs. Oscar lands a quick right cross to Mosley’s head, and Shane throws an effective body combination with some heavy blows. Shane again does some good body work in combination to close the round. Mosley did some more great body work and may have landed the best punch of the fight halfway through the round with his right hand. Oscar again though, dictated the pace and effectively worked his jab often. A very tough round to score. Round four opens with De La Hoya tagging Mosley with a straight right cross. De La Hoya lands a jab, and Mosley responds with two hard, left hook, right hook shots to the body. The action stops as the two combatants have a clash of heads. De La Hoya emerges with a cut opened over his right eye. The referee resumes the fight, and Shane and Oscar trade their jabs, Oscar’s was the stiffer of the two. Shane digs in with a good left hook to the body and Oscar responds with a good left hook to the body of his own. Oscar lands his double jab, and the action is still in the center of the ring. A hard right hand to the body by Mosley, Oscar responds with a right cross, left hook upstairs, not as hard as the right hand body blow by Shane though. Mosley lands some crunching body blows in combination. De La Hoya comes back with a quick right cross to the gut, and follows it up with a well landed jab up top. Shane is coming forward and Oscar catches him a left hook and follows it up with a stiff left jab. Mosley closes the round missing in combination. A very even round, with Shane landing the harder shots and Oscar dictating the pace a bit more and landing his jab often. Their exchanges throughout the round were very even. Shane Mosley begins the fifth round aggressively, coming forward. De La Hoya digs into the body well to start. Oscar pumps out his double jab twice and Shane counters well with his own right hand upstairs. The two exchange evenly with hellacious body punches. Oscar jabs Mosley up top well and Shane comes back, digging in with a right to the body. Oscar now, moving backwards, lands a good left hook. Oscar throws another left hook that is partially blocked, Mosley lands a good jab. Oscar jabs Mosley once to face, and Shane responds with a very good one-two. Oscar fires back with his own one-two. Shane throws a succession of hard right hands to the body. De La Hoya doubles up his left hook to the body, landing effectively, followed up a good right uppercut catching Shane coming in. Both men exchange left hooks upstairs and both land. Oscar goes downstairs in combination and then throws a single jab, and another single jab moments after. Oscar and Shane finish the round in a rapid, even exchange to the body. Oscar stealing steals the fifth with a strong last minute of the round. Round six begins again with both Oscar and Shane staying in the center of the ring. Oscar begins landing flush with his left jab, then works it downstairs and comes up top with the jab. Shane is marching forward and connects with a good left hook upstairs. The two exchange and neither are able land effectively. De La Hoya shoots a good left hook to the body, and follows it up with a jab to Mosley’s face. Shane continues coming on forward and lands a hard right hand across the top. Mosley now is coming forward with an improved defense. Oscar doubles up the jab upstairs, and a quick right cross. De La Hoya goes downstairs with a few good left hooks, and throws another left hook to the gut and follows it up with a right cross to the gut of Mosley. Mosley answers back with a flush left hook to Oscar’s cheek, a quick right hand retaliates from De La Hoya, without the same steam as Shane’s hook. Oscar closes the round with a good double jab to Mosley’s chest. Round seven begins again with Shane beings the aggressor. A quick right hand lands to the body by De La Hoya, Shane responds with a few good jabs. Oscar throws out the double jab and lands. Shane continuing onward, gets inside with a very good body combination, and follows it up with a right hand upstairs. Shane lands another right hand upstairs and follows it up with a good right hand to the stomach of De La Hoya. Oscar doubles up his left hook to the body well, Shane answers with a good one-two. Shane digs in hard with a left hook to the body and then a clinch ensues. Once separated, De La Hoya tags Shane with a quick right cross. Oscar jabs Shane flush upstairs and follows it up in a combination. Both men exchange punches and De La Hoya lands better leather. Shane responds strong, and nails De La Hoya with four punches on the inside. Oscar finishes up the round with a quick right cross and throws a flurry with most of the punches missing. A good round, Oscar outworked Shane a bit, and out jabbed him again. However, Shane’s aggression is becoming more effective, close round. Round eight begins again with Mosley coming forward, and he lands a hard right hand up top. Oscar comes back with a jab, and doubles it up right after. Shane digs in hard to the body with a right and a left, followed by a good left hook landed upstairs. Shane continues, digging into Oscar’s stomach with a hard right hand. Oscar comes back with a quick right cross, Shane responds with some good jabs of his own. A good left hook downstairs lands for Mosley, followed up shortly by another hard right hand to the body. De La Hoya closes the round with two quick right crosses. Easily Shane Mosley’s best round thus far, and he clearly won it. Round nine starts with Shane digging into the body with a hard right hand. Shane continues to be aggressive, but is caught coming in by a right cross, left hook two piece by De La Hoya. A double jab by Oscar lands, followed by a left hook. Shane lands a hard, crunching right to the body, followed by a jab to the head. Oscar comes back with left and right hooks in combination to the body. Mosley digs in with a left hook to the body and follows it up with a real hard right hand upstairs that lands flush. Shane digs in again with a hard right to the body, Shane then comes up top with a left hook and Oscar responds with his own left hook. On the inside Shane lands a good left hook, followed by a jab from the distance by Shane. Oscar rips Shane downstairs with a good left hook, then throws the left hook again this time to the head. Shane comes back with hard right hands to the body. The round closes with a good left hook downstairs landed by De La Hoya. Mosley wins the round on aggression and great body work. Oscar opens up the tenth round with his jab landing, Shane responds with his jab. Shane is still coming on forward and gets De La Hoya with a left hook to the body, Oscar responds with a left hook upstairs. Oscar and Shane trade their jabs to each others stomachs. Mosley left hooks Oscar up top and throws in a jab behind the hook. Oscar is now standing his ground, and receives a jab to the gut. Oscar retaliates with a right cross to Shane’s body, followed by De La Hoya’s left jab. Shane comes back with a hard right hand to the body. Oscar jabs Shane and then left hooks off the jab well. Shane begins pressing his momentum forward and lands a good jab,and Oscar fires back in combination with left hooks and right crosses. Shane marches forward and bangs De La Hoya to the body hard, in combination. Shane lands a good right hand to Oscar’s head, De La Hoya counters with a left hook. Oscar goes downstairs very effectively in combination, with lefts and rights. Oscar is finishing up the last minute of the round very well, but Shane was more effective for the first two minutes with his effective aggression and tremendous body work. Oscar’s jab isn’t as effective here in the tenth as it was earlier on. "Sugar" Shane now, changing the tide late in the fight. Round eleven opens with Shane continuing his aggression, coming forward. De La Hoya catches Shane coming in with a quick straight right hand, the two trade their left hooks downstairs, and both connect. Mosley lands a hard right hand over the top, and catches Oscar with the same punch moments after. Oscar comes back with his left hook to the body, then jabs downstairs and brings it upstairs. Shane jabs to Oscar’s gut and sets up some very good body work in combination. Oscar sticks out his stiff jab to the face of Mosley, Mosley connects in response with his left hook. Oscar throws a straight right, left hook to fire back. For one of the first times all night, De La Hoya’s back is to the ropes, and Mosley makes him pay, nailing him in combination to the body. Shane goes upstairs with a right and finishes it up with a left hook to the body. Oscar gets in a good left uppercut, followed by a flurry upstairs. Shane finishes up the round by nailing Oscar with a right to the body and a jab upstairs. Shane Mosley’s round, and he’s gotten himself right back into the fight, it’s tightened up on the cards. The Twelfth and final round begins like practically the whole fight has been: in the center of the ring. Mosley opens up the action by firing and landing a right hand, and De La Hoya responds with an abundance of punches that gets the crowd roaring, few landed but it seemed to be an impressionable stand to hold off Mosley’s momentum. Shane connects to the Oscar’s face with a good right hand and De La Hoya fires back his left hook. Moments after the exchange Mosley stuns De La Hoya with a flush right hand, and follows it up with left hooks upstairs. A succession of hard right hand body shots dig in to De La Hoya’s stomach. Oscar now moving backwards, catches Shane flush with a right cross. Oscar comes with a left hook landing on the inside, followed by a right cross and then a stiff jab. Shane responds well with his jab, Shane gets caught coming in by Oscar’s straight right hand. De La Hoya slips in a left hook on the inside, then doubles up his left jab and connects with a right uppercut. Oscar finishes the final battle with a good exchange. Shane won the first minute and a half, De La Hoya won the last minute and a half. 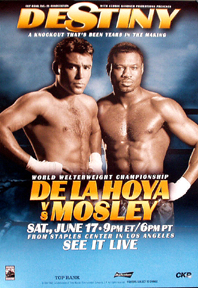 De La Hoya 116 Mosley 114. In this grudge match between De La Hoya and Mosley, you would have to give Shane the benefit of the doubt to have it reasonably been scored a draw. However, Bleachereportboxing will just have to respectfully disagree with the three veteran judges assigned for this bout. Even with the benefit of the doubt for Shane, it is unforeseeable how you can give him seven rounds in which he won: 115-113 for Mosley as just a scorecard, Bleachereportboxing cannot fathom being correct. Bearing in mind that it was indeed a very competitive, hard fought, and very close fight. De La Hoya convincingly beat Shane for the first half of the fight even more so than Shane did Oscar in the second half. Shane from rounds eight to eleven swept them, but those are only four rounds, leaving eight other rounds. As said previously, you would have to give Shane the benefit of the doubt to give him two of those eight rounds. However, to give Shane three of those eight rounds is just something Bleachereportboxing finds very disagreeable. 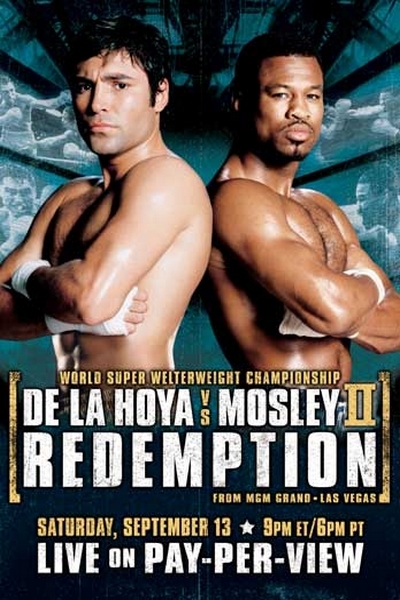 In short: De La Hoya beat Mosley just as close and convincingly as Shane beat Oscar three years before in Los Angeles. So just as Mosley was awarded his deserved victory, Oscar deserved the same. Through compubox numbers, De La Hoya significantly threw more punches than Shane, and was dead even with Shane in power punches, and dominated him in the jab department. Although it was an entertaining prize fight, it was not a brawl. So those numbers show that Oscar was superior in a boxer-puncher type of bout. Through Oscar not getting the decision he had deserved in the eyes of many, it took his career path in a different direction. The next year De La Hoya wound up biting off more than he can chew by climbing up in weight another six pounds to face the predominantly bigger, Undisputed Middleweight Champion, Bernard Hopkins. De La Hoya, had fought well through the first half of the bout, but was the much smaller man. His signature left hook was not nearly as devastating as it was at the Welterweight weight classes, especially with Hopkins who had been a Middleweight for years and held a 3 inch height advantage. No discredit to Hopkins, who finished De La Hoya off with a left hook to the liver in the 9th round. Had De La Hoya been given the decision he felt he deserved; which he would later fight to protest the Nevada State Athletic Commission to overturn the verdict which went to no avail for Oscar, he may have never wound up moving up to Middleweight in the first place. This is all what-ifs, but there is validity to it. Oscar would still have his Junior Middleweight Championship and would have avenged his defeat to Mosley to settle the score even. He could later wait to try and avenge his other defeat with Felix Trinidad, possibly meet down the road with the World Class Ronald “Winky” Wright, or even have a respected third bout with “Sugar” Shane. On a side note, HBO themselves very much disagreed with the decision, although they had said they had seen bigger “Highway robberies” than this before. Still, they felt De La Hoya clearly won a competitive bout. Former great Heavyweight Champion of the World, “Big” George Foreman, seemed to be the most up in arms, although calmly. George just felt it was not right and hinted that possibly De La Hoya’s leaving of Top Rank promotion, to begin his own stable, may have had something to do with the disputed decision. Soon after years of George working and calling fights for HBO he retired from the job. Just another one of the many controversial bouts in boxing history, and it sure won’t be the last. The record books will always show that Mosley bested De La Hoya 2-0, but in the opinion of many fans, experts, and this website it should stand as 1-1. Another unfortunate controversy that would surround the two great Champions is that we would later find out that Mosley, who had passed a through Nevada State Athletic Commission’s drug testing policy, later admitted on court and on camera that he knowingly taken Performance Enhancing Drugs. It may leave one to wonder had Shane been on them all along? Or was it just because he had come up in weight nineteen pounds in just under three years? We may never know, none the less Shane Mosley is a great hall of fame caliber World Champion. This was a great rivalry no matter the controversy between Southern California’s own “Sugar” Shane Mosley and East LA’s “The Golden Boy” Oscar De La Hoya. Two fights that any boxing enthusiast should take a second look at it. "Sugar" Shane, fresh off claiming De La Hoya's Light Middleweight Championship.